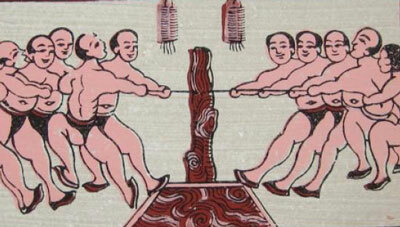 Tug of War is among the most ancient of games and no doubt developed independently in multiple places around the world. It is a game that probably arose quite naturally as it is instinctive to hold onto something you want when someone tries to take it away from you. Animals also play this game, as many of us know when we play tug with our dogs. The oldest image of Tug Of War dates from about 4,000 years ago in Ancient Egypt, but that doesn’t mean people in other ancient civilizations didn’t play, it just means no one else left an image that has survived. Ancient China has a legend that Tug Of War was invented at the dawn of time when the Sun and Moon played to determine the amount of light and darkness in the world. For something more than a legend there are Chinese written accounts that say the game was used to train warriors almost 3,000 years ago. Mentions of the game crop up in Ancient Greece, (500 BCE), Scandinavia & N. Germany, (1000 CE), India, (1100’s CE), France, and Japan (1500’s CE) as well as in many other countries. It has been played in many different ways, by pulling each other’s arms, by holding around the waist and pulling, and by using something like a rope or piece of skin to pull on. These are the more common versions, although versions using sticks, bamboo etc are also played. 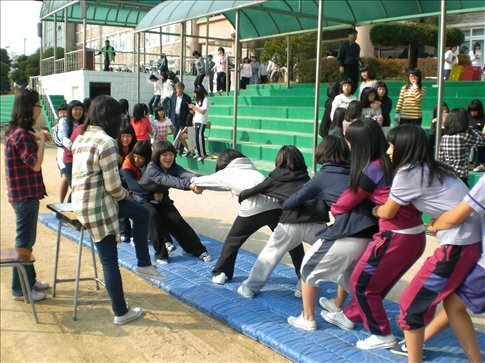 In Korea you can still find playground games played with a couple of these methods. Played by two people it is mostly a game of strength, played by multiple it becomes a game of teamwork and strategy, as well as strength. In Korea both girls and boys play Tug Of War, although it seems the arms around waists version is perhaps more popular with girls. 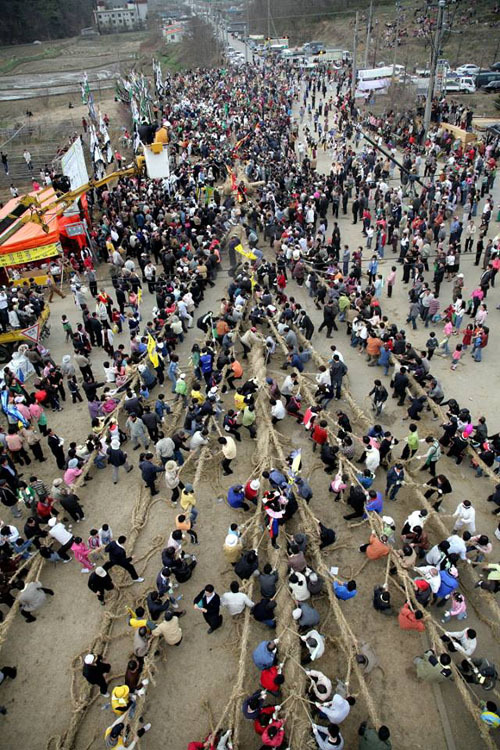 The most famous Tug Of War game in Korea is called Juldarigi. This version uses huge ropes and whole villages of people to play. It has its’ origins in agrarian practices from long ago that took place to try and ensure a good harvest. Once quite prevalent all over Korea in rural areas, it has dwindled down to only a few places, the most famous nowadays being held in Dangjin, and in Yeongsang. The rope used can vary in size, but can be up to 200 metres in length, over a metre in diameter, and weigh up to 40 tons. It takes a communal effort by a lot of people, plus experts who know how to direct said people, to make the rope. In danger of dying out, some communities are looking for young people to learn the skill to prevent that happening. 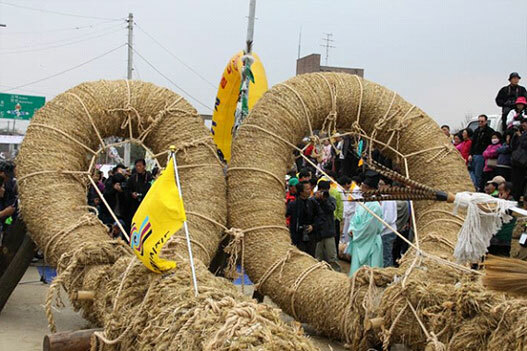 In 2015 ‘rope tugging’ rituals from 4 countries, including S.Korea, were placed on the UNESCO world intangible cultural heritage list, as of importance, and as something that should be preserved. The rope can be made from a single strand using rice straw, but when made with 2 strands it will have an ‘am’ strand, which is female and twisted to the left, and a ‘su’ strand, which is male and twisted to the right. These two strands are then twisted together. Sometimes ropes are made from 3 strands twisted together. Each rope is made with a large loop at the end, one smaller than the other. There’s a lot of symbolism attached to the game, with the ropes being likened to snakes, or imugis, otherwise known as young or immature dragons. In Korean folklore dragons are associated with water and agriculture, they often live near rivers and waterfalls, and can bring rain. There is an old saying, ‘the rain cloud follows the dragon,’ and since rain is important to agricultural communities they prayed to the earth, the dragon, local mountains, and performed other shamanistic rituals in the hope of a bumper harvest and general bounty for the area. Sometimes Juldarigi was played on a regular basis, perhaps every three years, and sometimes it was played only in times of drought to bring the rain. Different areas had slightly different rituals and timing, although it was mostly associated with Daeboreum, a celebration of the first full moon of the new year. The large central rope has lots of smaller ropes woven into it along its’ length and a fan of medium ropes are attached at the opposite end to the large loop. The two teams are often divided into East & West, or North & South, or Male & Female. In general it is more beneficial for the female team to win because of the association of women with childbearing, fruitfulness and fecundity. The women’s team could also include unmarried men, and the men’s team could decide to not use all their strength, thereby losing to ensure prosperity. Nowadays it doesn’t matter so much as Juldarigi is more a festival and celebrations of old customs than a ritual to bring good fortune to the village. The male and female ropes are paraded to the competition area, accompanied by traditional percussion music, flag waving, dancers, and supporters. Sometimes a person or two ‘ride’ the rope to yell insults, jeers, and ribald remarks. In some cases a sword fight might even ensue. Finally one rope is inserted through the loop of the other, often accompanied by sexual innuendo jokes, and a log is set in place to hold them together. The two teams grab the smaller ropes wherever they can and on a signal they begin to pull. Nowadays this can be over in a matter of minutes, but long ago it is said the tugging battle could go on so long they had to have rest periods. Once over, the ropes are often broken down and bits carried away by the participants for good luck, with the luckiest bits being the two loops. It was also thought that for an infertile woman stepping over the opponent’s rope would make her fertile, or make sure a fertile woman who did so would have a male baby. Youtube has multiple videos showing Juldarigi, but I would suggest if you ever get the chance to see it in person it no doubt would be an epic experience. I have it on my list of what I still need to see and do in Korea. You might also enjoy Ssireum: Korean Style Wrestling, Traditional Sledding In Korea, Seokjeon, and Horseback Archery In Korea. All photo credits are to original owners, mostly Korean Tourism sites. ← Cats And Dogs: Animal Cafes In Seoul.